Simplify your image and drawing review and conversion needs with ComPara, a fast and efficient tool to compare and publish the differences in your multipage PDF and scanned TIFF image and drawing files. ComPara provides a tool to compare multipage drawing sets, identify or tag the differences, and publish them for easy communications with your teams and suppliers. Easily convert files to PDF, TIFF or JPG. Watch the YouTube product overview or our SlideShare presentation. ComPara is included at no charge with our ImageRamp PDF Composer tool. With PDF Composer, easily import PDF, Image, and Word documents into an easy-to-use environment to securely annotate, redact, encrypt and arrange your documents. 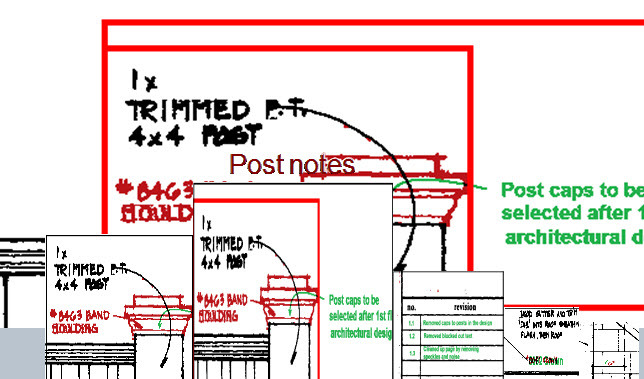 Easily identify and communicate drawing set differences on small and large multipage files. Compare PDF or TIFF Files – Compare differences with vector or image-based PDF drawings or scanned TIFF drawings. Multi-page Compare– Quickly flip through multi-page documents and compare drawing sets with ease. Use the page flipper to synchronize page comparisons, or navigate to any page pair for review. Tag Differences - Identify and name differences within multipage drawings. As tags are made, thumbnails are created for easy bubble bar navigation and tags can be published for design team reviews. Synchronized Side-by-Side Compare – Easily compare differences between files in a synchronized side-by-side viewer. Any zooms, pans in one view are synchronized with the adjoining view. Overlay Compare – Merge the two documents with color-coded additions and deletions in clear view. Publish Tagged Differences– Create a new PDF file that contains changes found in the document. It eve5n publishes page pairs that contain the differences you tagged. 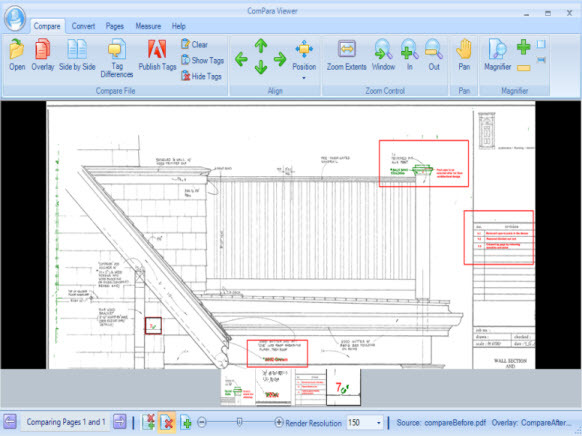 Manage Pages – Easily insert or replace pages from other files into your drawing file or delete selected pages. ComPara lets you extract individual pages and save them as separate files as well. And, easily rotate pages to correct page feed errors. 2D Adaptive Thresholding – Clean dirty documents with advanced adaptive thresholding. Adaptive thresholding assists in cleaning "dirty" documents or documents that have a colored background which interferes with the foreground data. Convert Files – Open a PDF or TIFF file and easily save the whole file or select pages as PDF or TIFF files. Or, save pages individually to JPG format.